Height: 11 – 14cm (4 1/5 – 5 3/5 inches) depending on whether he is hand or machine knit. Scraps of 4 ply (baby, or sport weight yarn) in the following colours: yellow, red, white and black. approx 30sts to 10cm. Since this toy is so small exact gauge really isn’t very important. 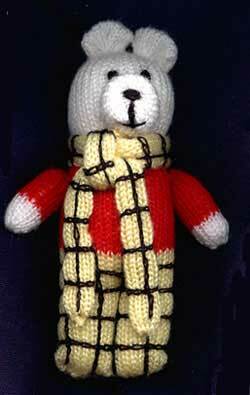 NOTE: For a plain teddy bear work the whole bear in one colour and omit the embroidered checks, scarf is optional. Using 2mm needles cast on 36 sts and work st st in the following colour sequence: 16 rows yellow, 20 rows red, and 22 rows white. Cut yarn and thread through sts but do not pull tight. Using red cast on 12 sts and work 10 rows st st. Change to red and work 6 rows st st. Thread yarn through sts, pull tight and fasten off. Using white cast on 10sts and work 12 rows st st. Cast off. Cast on 10sts and work approx 12 inches (30cm) st st. Cast off. Using black yarn embroider checks on pants and scarf. Fold scarf into a tube and sew side seams, gather ends and secure. Sew bottom and side seams of body. Stuff lightly and gather the top of the head and secure. Gather the neck to form a round, plump head. Sew through body at legs to within approx 2/5 inch (1cm) of red shirt. Fold ears in half, matching cast off and cast on edges. Sew sides, gather at bottom and sew either side of the gather at the top of the head. Sew side seams of arms, stuff and sew to body. Tie scarf around neck and secure. Sew side seam of snout, stuff, and sew to face. This pattern and all images on this page are Copyright © Sarah Bradberry May 1998. All rights reserved.